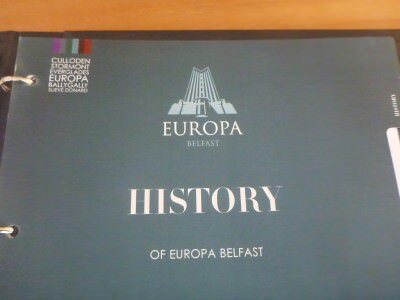 The famous Europa Hotel, Belfast, Northern Ireland. On my trip backpacking in Northern Ireland in 2014, lived out some childhood dreams as well as aiming to inspire everyone out there to visit Belfast and Northern Ireland. 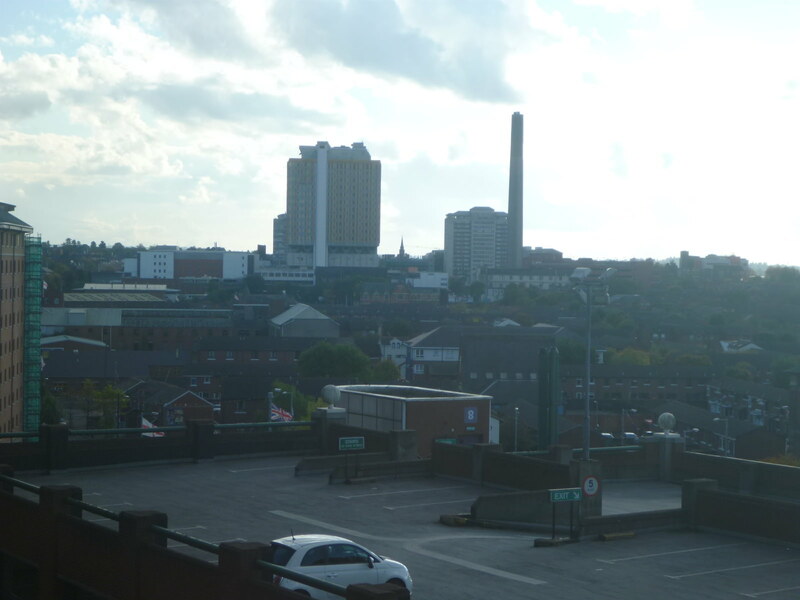 In my eyes, Belfast is the best city in the UK and is in the top 10 cities in the world. 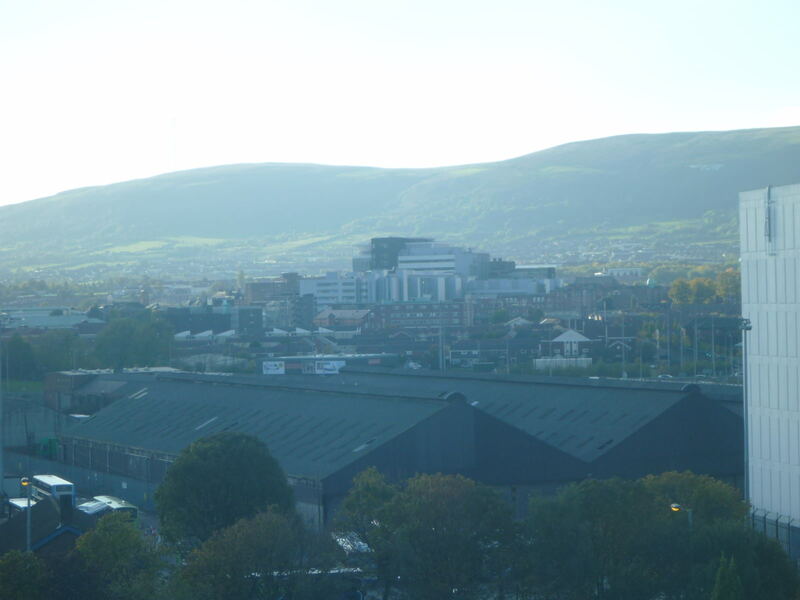 As tourists flock to London, Manchester and Edinburgh, the Northern Irish capital city Belfast glides by gracefully in the background, somewhat un-noticed. 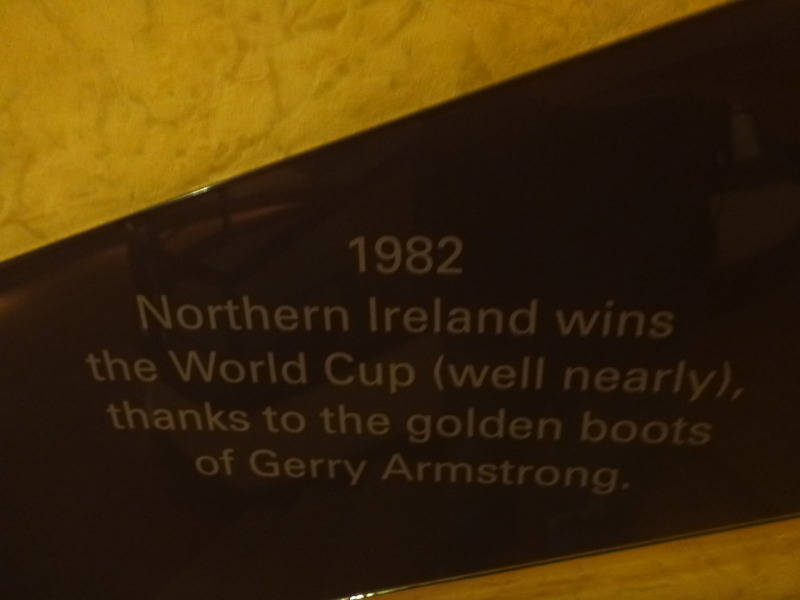 Staying in the Famous Europa Hotel in Belfast, Northern Ireland. 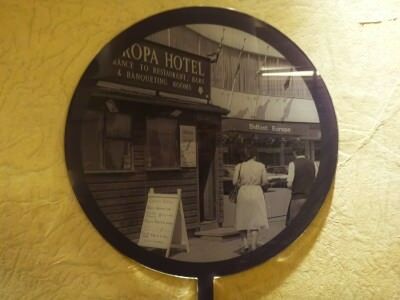 As a child I will always remember the famous Europa Hotel. 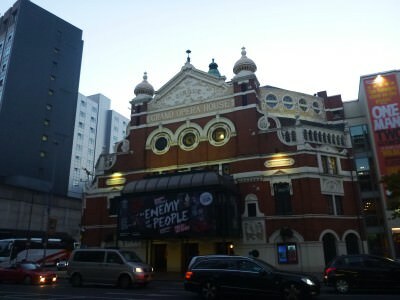 This magnificent structure in Great Victoria Street was once the most bombed hotel in Europe, if not the world. 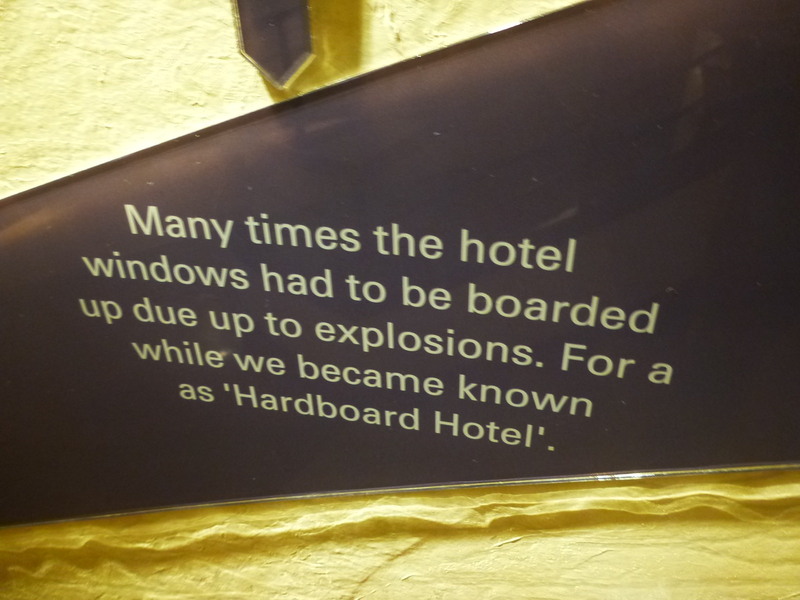 The windows were shattered so often by bombs, that they were boarded up, as I recall. 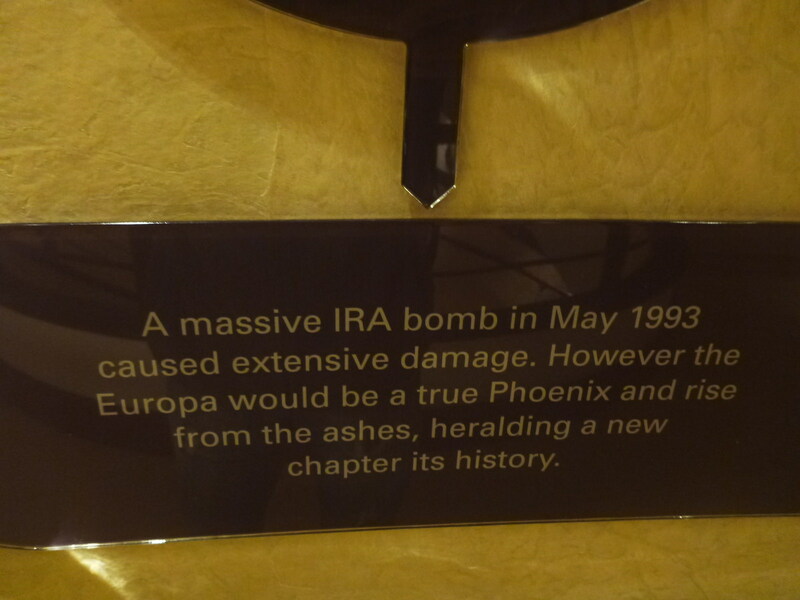 However, thankfully those days have passed Belfast by. 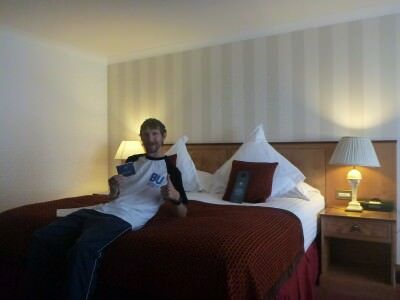 Excuse the pun but tourism in Belfast has been “booming” lately. This is the coolest city in the UK and the Europa is a luxury hotel which typifies the new school Northern Ireland, post troubles, ceasefires and the 1998 Good Friday Agreement. 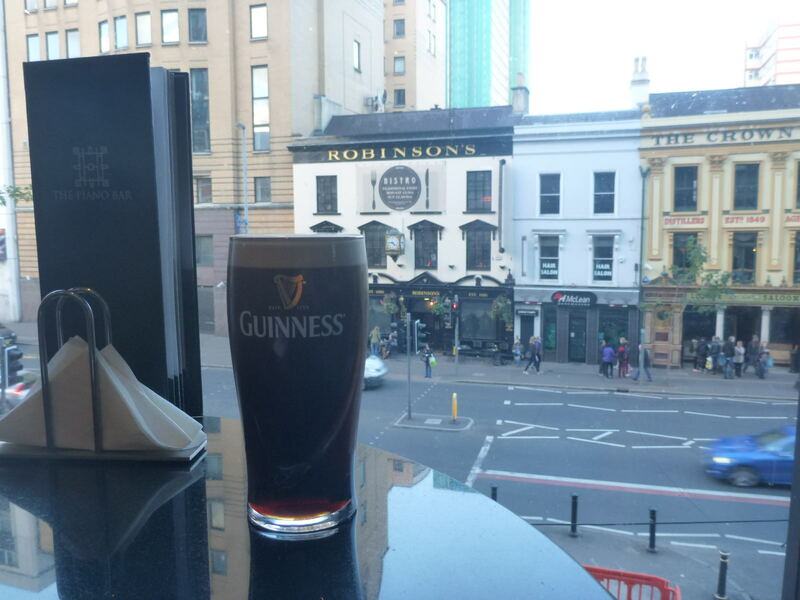 If you want to live it up for a bit in Belfast City, the Europa Hotel is the place to be. 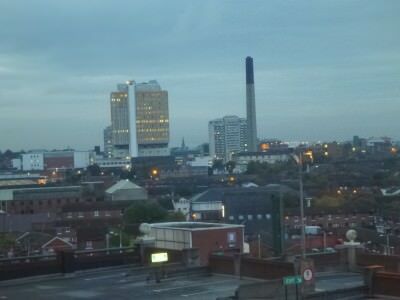 Belfast City from my hotel room in the Europa. Working in the Europa Hotel. 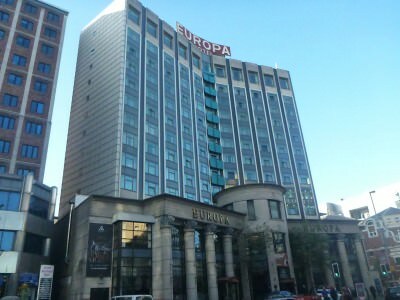 The Europa Hotel is finally getting the publicity it deserves and it was always a dream of mine to spend a night there. On my journey from Bangor to Coleraine, I decided to stop off for a day in the capital and spend a night here rediscovering my home capital city. 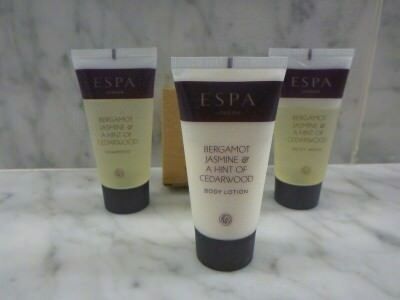 My night in the Europa Hotel, Belfast, Northern Ireland. 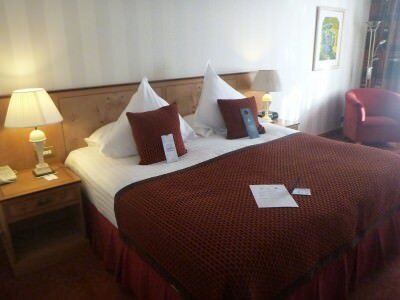 On a personal level though, my Mum was in hospital so it was a quick night here but one that I relaxed during and I knew my Mum was happy I was staying here in luxury for a night. 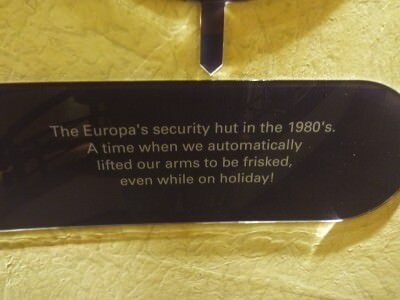 And luxury it was! Loving the Europa’s pure luxury. 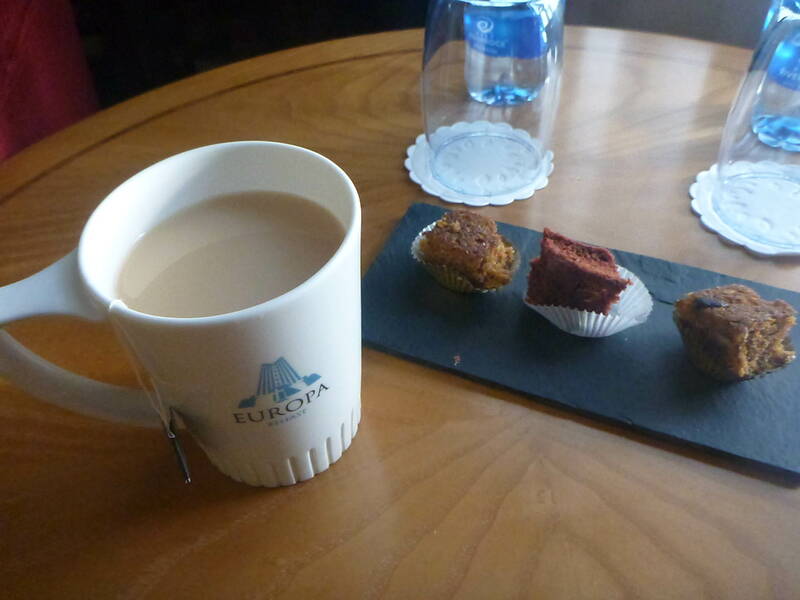 Here are 10 simply incredible things I loved about my stay in the Europa Hotel. As I mentioned this hotel has a lot of history. Bombed in the 70s, 80s and 90s maybe, but the hotel survived, recovered and is now the best hotel in Belfast in my opinion, and has a strong argument for the best hotel in Northern Ireland. 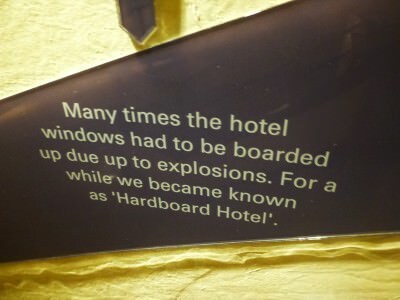 Each room has a history folder in it. A folder with information on the Europa’s history. 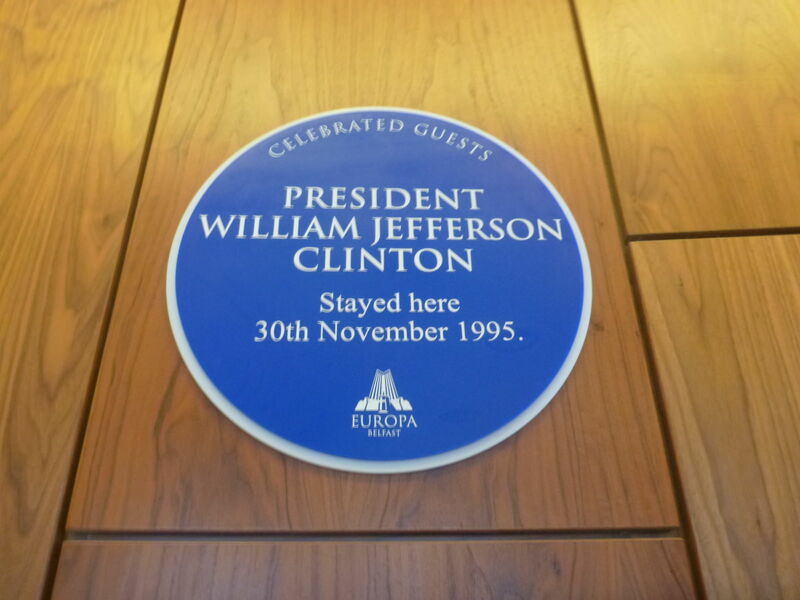 You’re staying in a historic building here that’s for sure! 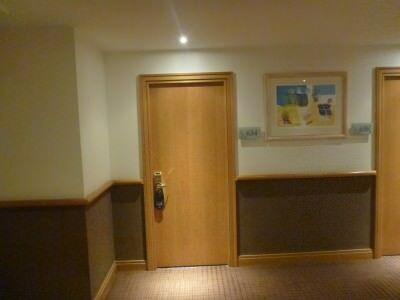 When I opened the door of the room I was just amazed by it. As a general rule, Northern Irish people are tidy, clean and well presented and the Europa fits with this local stereotype. 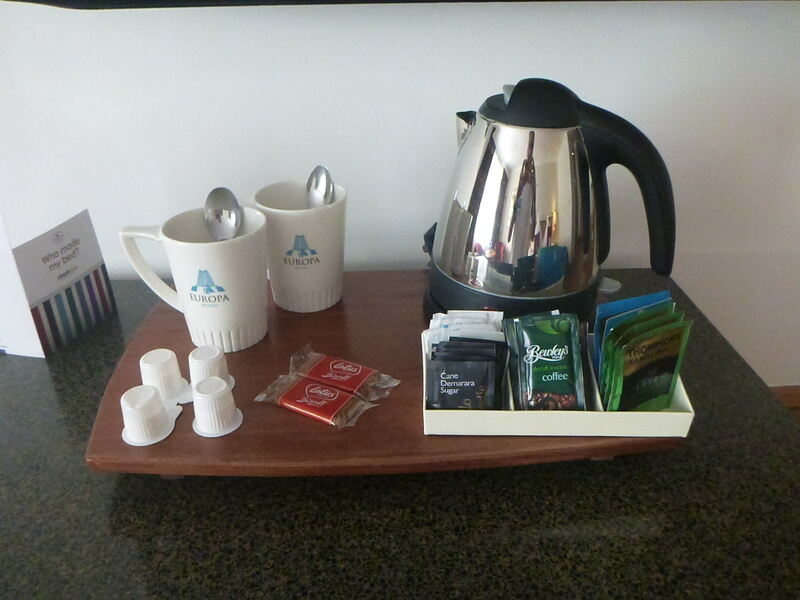 Pristine rooms, carefully laid towels, tea and coffee stand neatly on the cabinet and everything immaculate for your entrance. 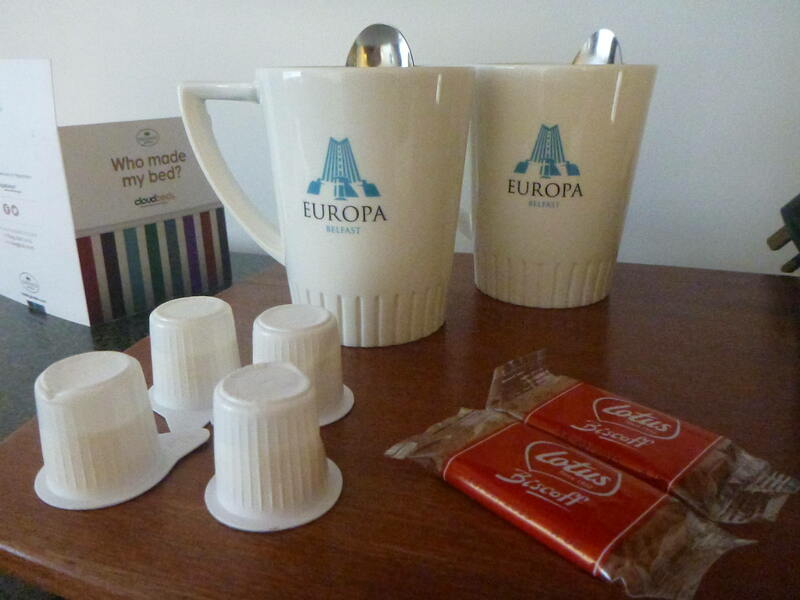 The Europa is well positioned. Slap bang in central Belfast. 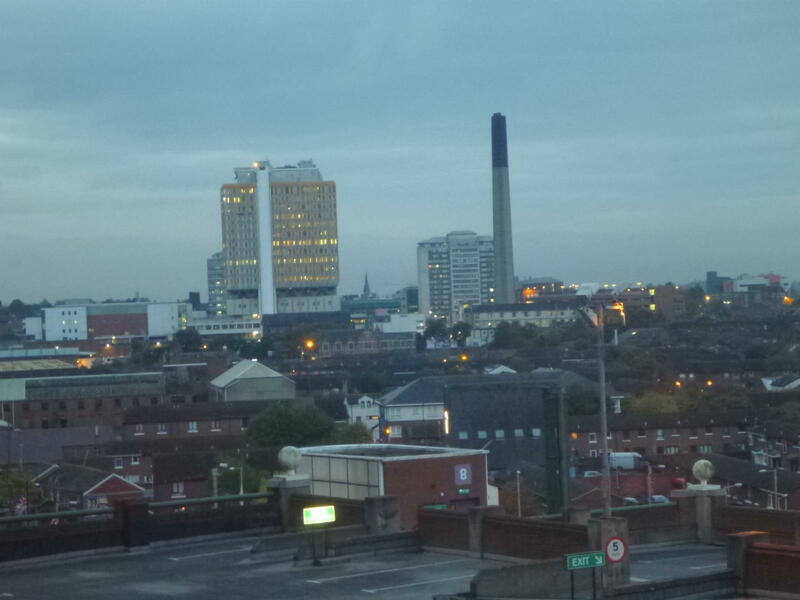 Views from rooms at the front will catch the magnificent City Hall and the famous cranes in East Belfast (Samson and Goliath) plus the Crown Bar and Robinsons. 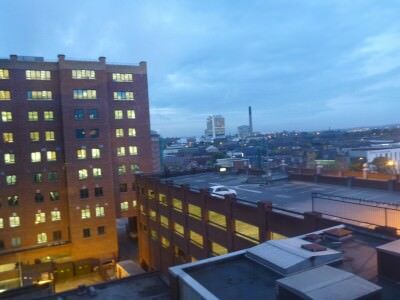 View out my window early morning. My room was 634 and had a view out to Sandy Row, the City Hospital and Windsor Park. Awesome! View out my window in the afternoon. 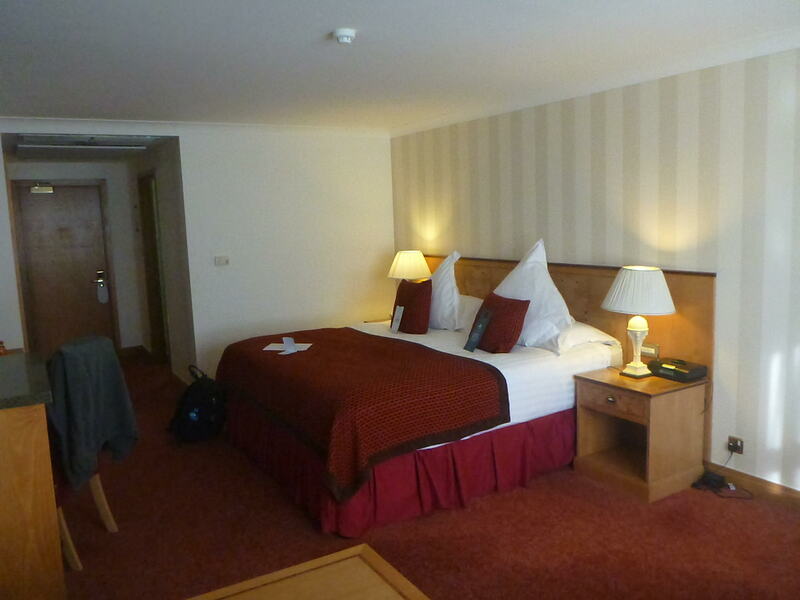 Situated in the heart of Belfast, the Europa Hotel is perfect for exploring Belfast City. 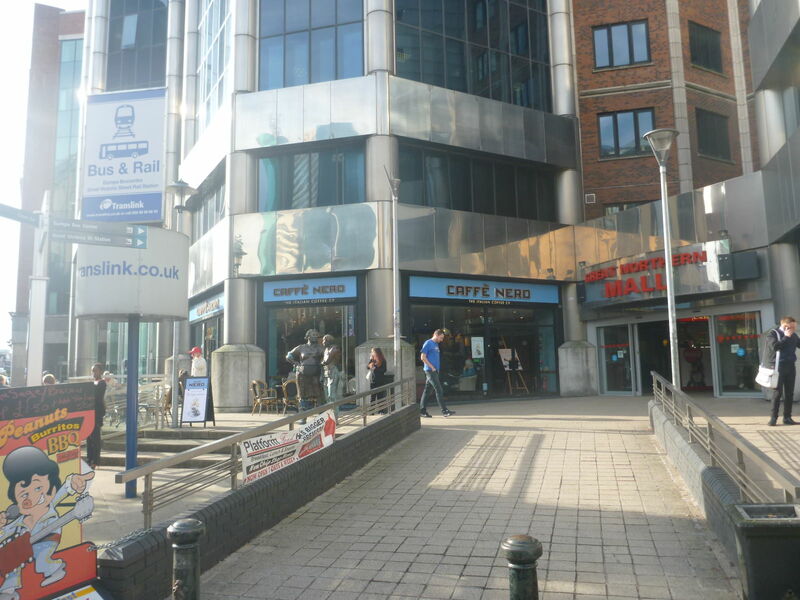 The City Hall, the Grand Opera House, the famous Crown Bar are all within a few minutes walk! Grand Opera House – right beside the Europa Hotel. The famous Crown Liquor Saloon – right opposite the Europa Hotel. Even better right next to the Europa is the bus and train station which serves not just all of Northern Ireland, but parts of Ireland too. In two hours you could be in Dublin if you really want. Though personally, I’d recommend a train north to Coleraine or Londonderry/Derry. The bus and train station is right next door. Some hotels I have stayed in recently annoyed me by not having free tea and coffee. To me, for a 4 star hotel, it should be standard. The Europa doesn’t disappoint. 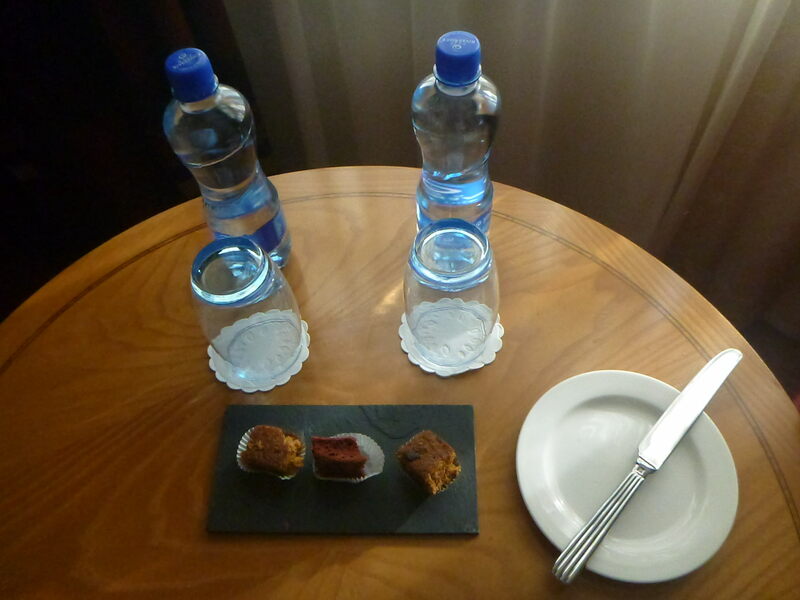 Not only this but two free bottles of River Rock water and 3 mini cakes on arrival! Excellent. 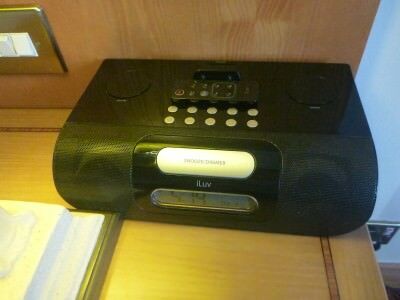 Oh the luxury of the room I was in (634) – I had a bath and a shower!! Amazing – pure fire way to relax. 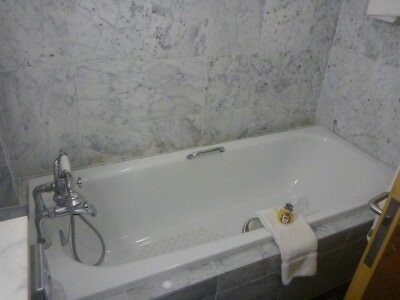 Hot water, luxury toiletries and peace at last. The Europa boasts a few bars including the Lobby Bar and the Piano Bar. I’ve had a beer in both, and on this occasion I chose the Piano Bar as it offers a view down over the street. Sit with your fresh pint of Guinness overlooking Great Victoria Street, watching the world go by…wifi as a bonus too! Guess what? My bed was so comfy that I fell asleep early and didn’t waken until sunrise! Amazing – thanks Europa – best sleep in months and months, even better than the luxury nights in Xanadu in Belize and Casa Morada in Mexico! 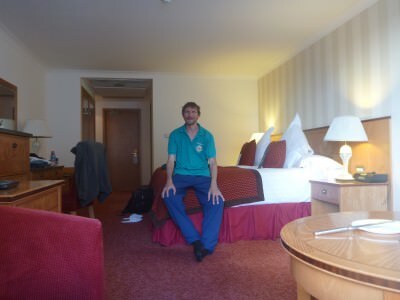 Just comfy – my bed in the Europa Hotel. In terms of breakfast, quite simply you are spoilt for choice here at the Europa. 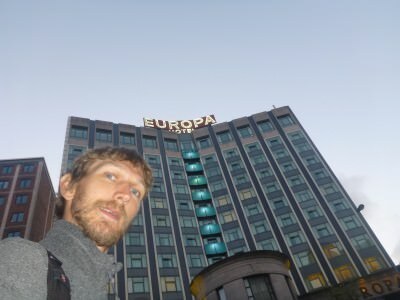 What I really love though is that the Europa Hotel keeps it local. It doesn’t forget where it is and you won’t forget where you are. You’re in Northern Ireland and the breakfast options reflect this. 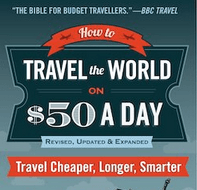 Check these 4 cool local options out!! 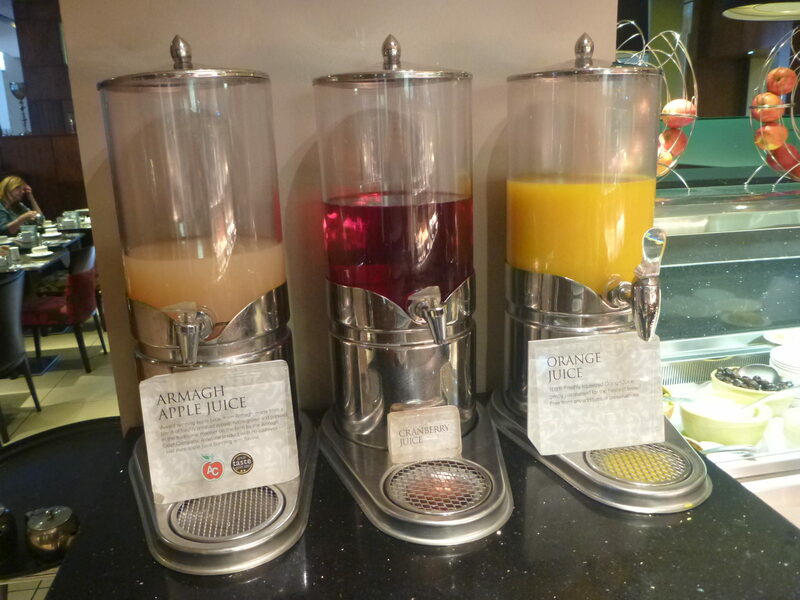 – Armagh Apple Juice – yes they have freshly pressed Apple juice all the way from Armagh. 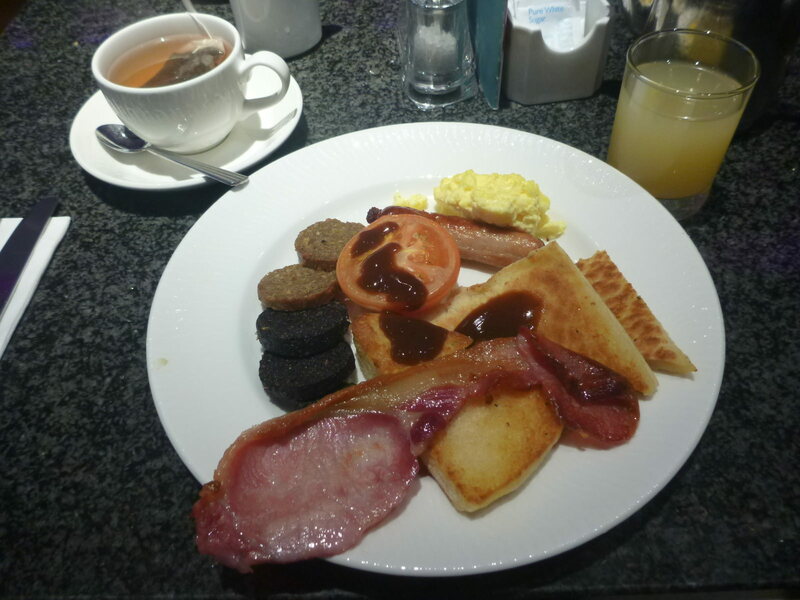 – Ulster Fry buffet featuring Black and White Pudding (Irish specialities). Eat as much or as little as you like. The Ulster Fry is Northern Ireland’s iconic and quintessential morning feast. 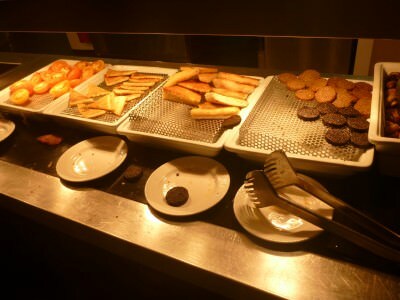 Ulster Fry Buffet – eat as much or as little as you like. – Bushmills Whiskey Porridge – yes you’re thinking “what?” but the local whiskey here Bushmills is world famous and the Europa encourages you to try a drop of whiskey and cream in your morning porridge! Kickstart your day with a boom! 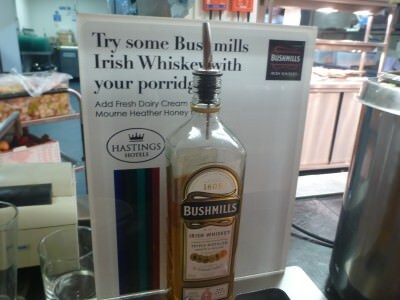 Put some Bushmills whiskey in your porridge? 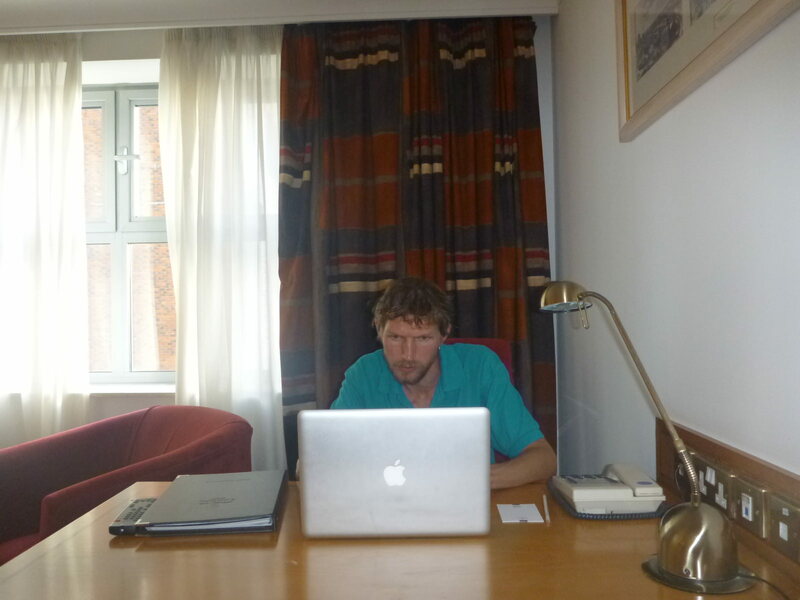 Why Not – you’re in Northern Ireland! 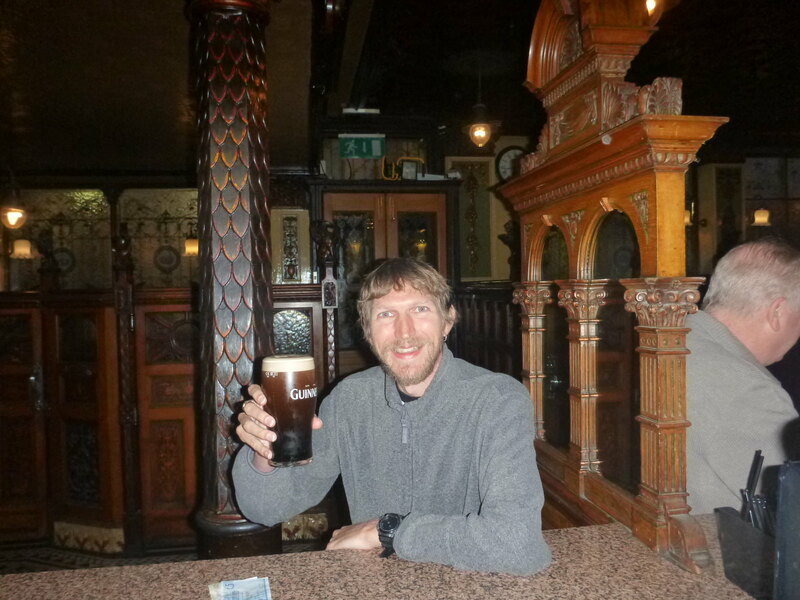 – Irish Tea – It’s not just a myth from the Father Ted series. 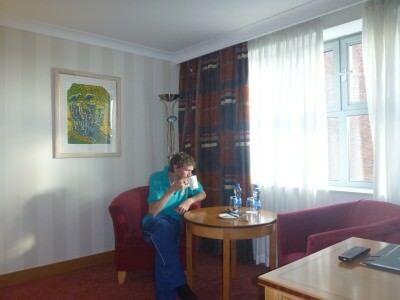 Irish people love their tea! Ask the staff for a pot of local tea and you can’t go wrong! Pot of Irish tea with my Ulster Fry! 10. 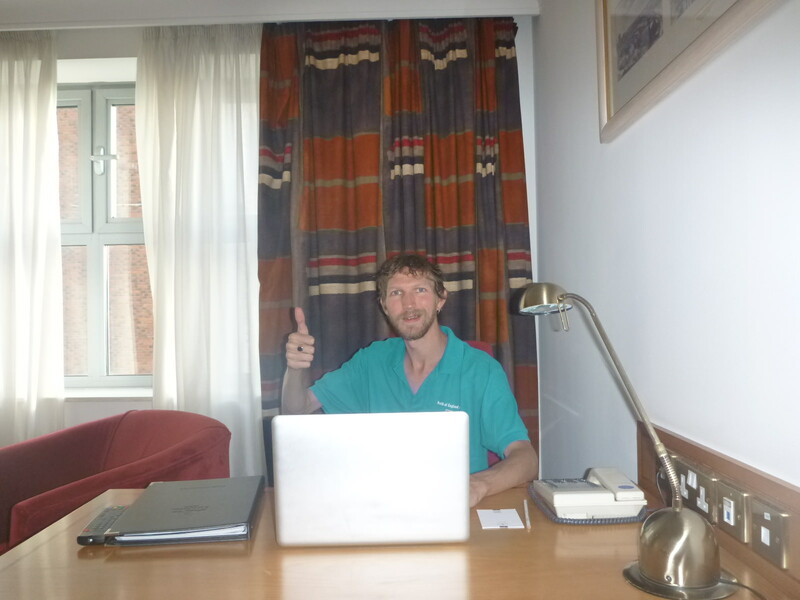 Survival – you did it!! 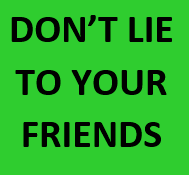 Some people really do it just to say they did it. 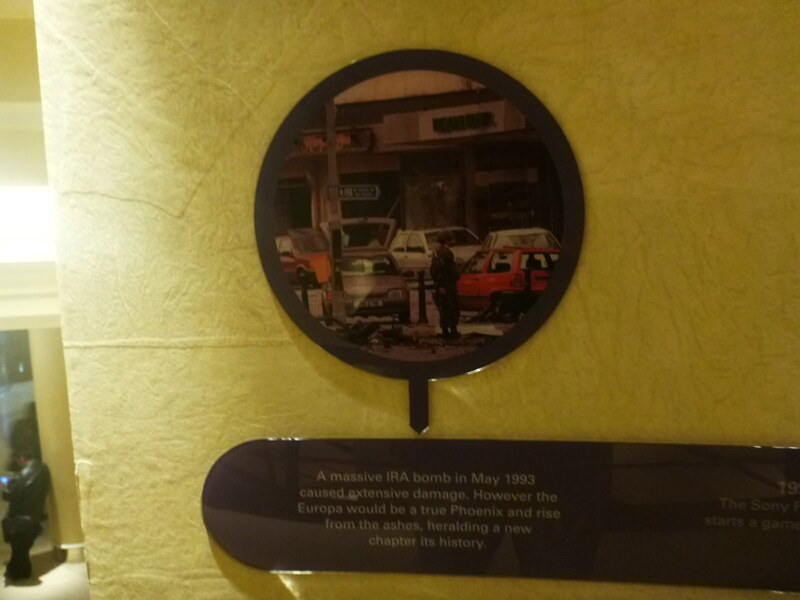 They stay here just to say “I stayed in the Europa Hotel and I survived”. 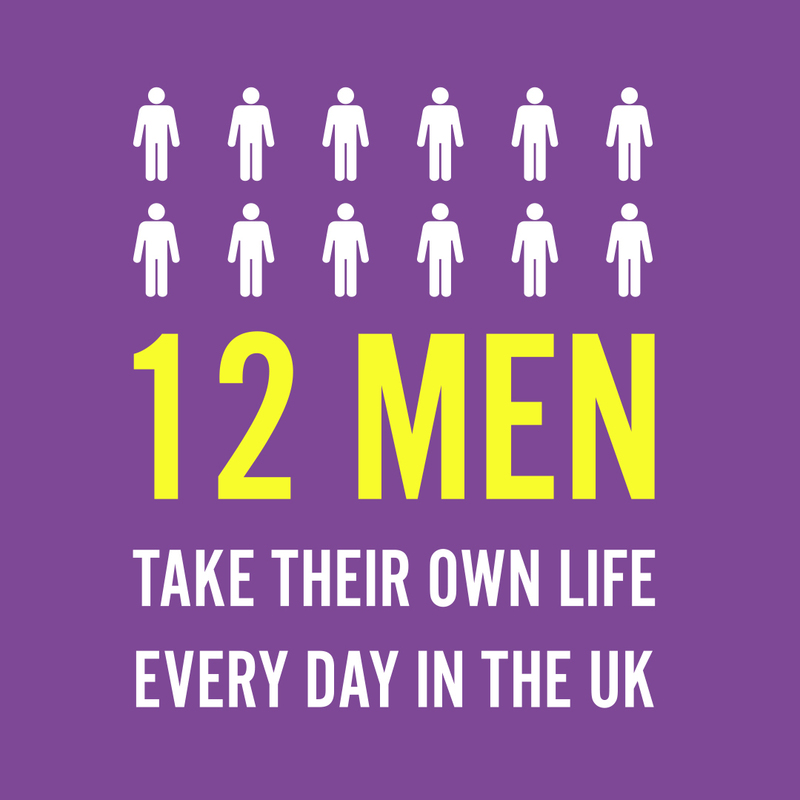 And so my friends, this ironically is as good a reason as any. 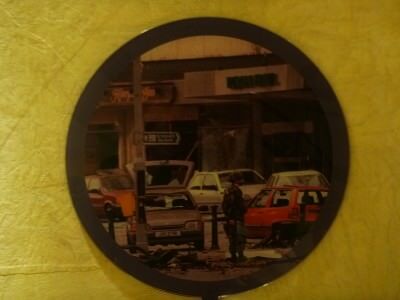 Belfast is safe remember – the locals are great craic – they’ll welcome you to their capital. Besides, President Bill Clinton once stayed here so you can also brag about that. 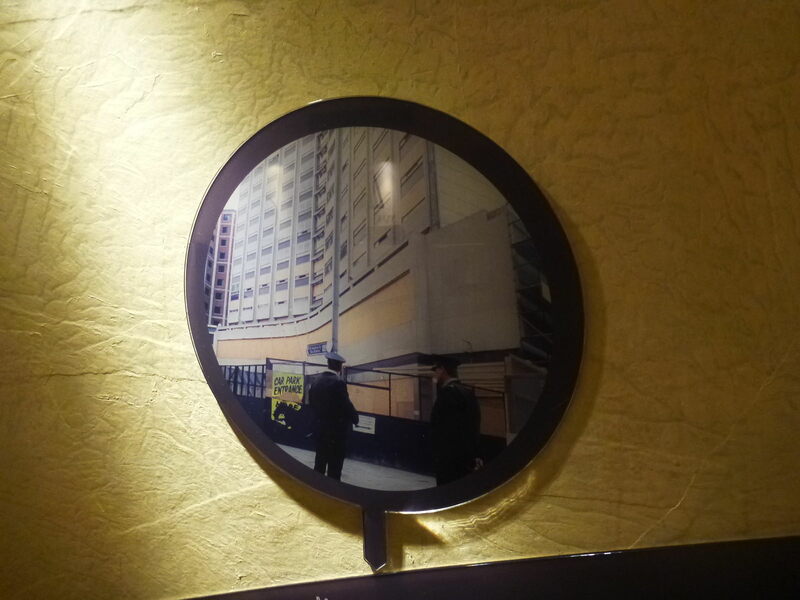 Bill Clinton once stayed here. Yes I survived the Europa! So just like the time I stayed in the world’s most dangerous city (San Pedro Sula in Honduras), I had now survived the hotel which was once the most bombed in the world. While “The troubles” took their toll on Northern Ireland, right now, Belfast is the cool and cultured city it always was and you really need to give it a visit. 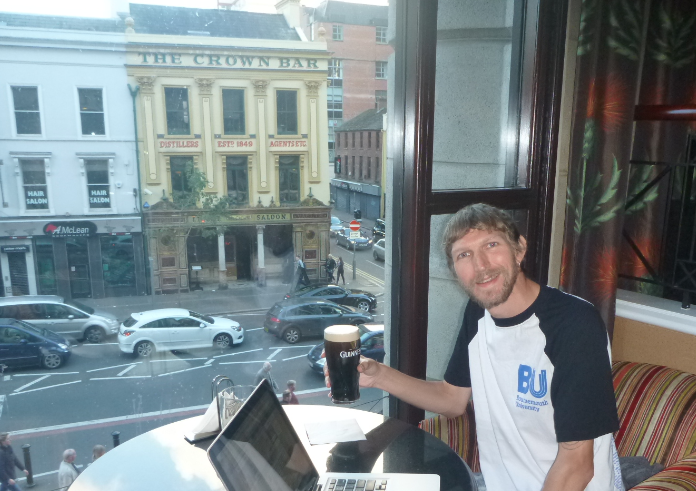 I’ll convince you, don’t worry, plenty more posts on Belfast City to come. 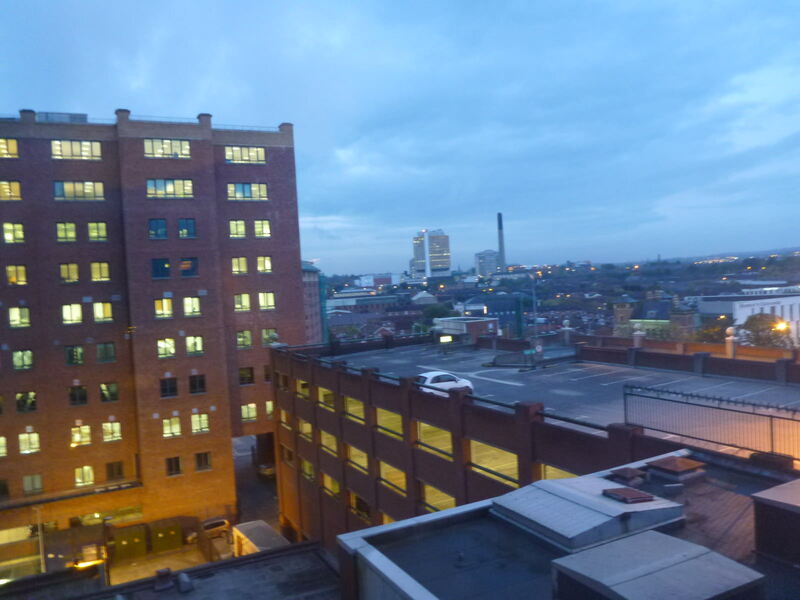 Early evening view from my hotel room. 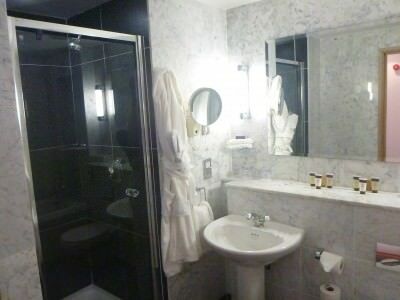 – A choice of 272 bedrooms – including 92 Executive Bedrooms and Suites. 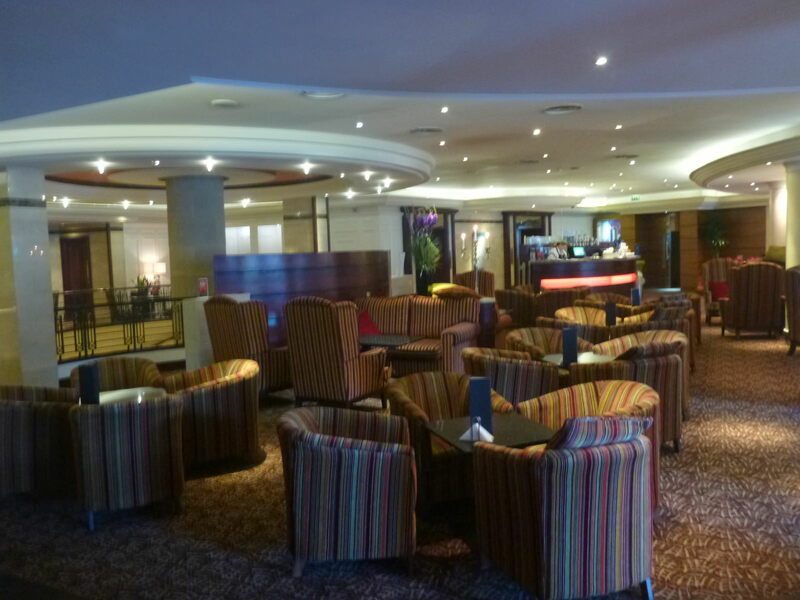 – The elegant décor, contemporary bistro, bustling bar and relaxing piano bar lounge make the four star Europa Hotel the hotel of choice for business and leisure guests visiting Belfast. – Due to its prime location, the Europa Hotel is a short distance from many of Belfast’s top visitor attractions including the Ulster Museum,Grand Opera House, City Hall, Titanic Belfast, the Waterfront Hall and the Odyssey Arena. This entry was posted in Accommodation, Bars, Belfast, Europe, Hotels, Northern Ireland. Bookmark the permalink.